Hot on the heels of the new BMW 5 Series Saloon that goes on sale in March, BMW's popular Touring model will reach the UK market in September 2010. It will be the fourth generation of Touring models in the 5 Series range and brings traditional BMW driving qualities and elegance to those seeking flexibility, adaptability and versatility from their car. Initially available in four derivatives, the new BMW 5 Series Touring offers a choice of two petrol cars, the 523i and 535i, and two diesel models, the 520d and 530d. All four are packed with innovative technology that ensures class-leading performance, fuel economy and CO2 emissions, while providing an elegant, comfortable and driver-oriented estate car. Tim Abbott, Managing Director of BMW UK, said: "BMW can fairly claim to have created the idea to turn executive saloon cars into practical yet still fun to drive estates with its first 5 Series Touring in the UK back in 1991. Up until then most large estates were utilitarian load-luggers that eschewed both the driving capabilities of their saloon cousins as well as the style. The 5 Series Touring changed all that and its success has led to the new fourth generation being unveiled today. 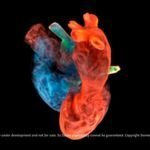 "Since the UK is the third largest market for the 5 Series Touring, this new model is an important and exciting one for us. 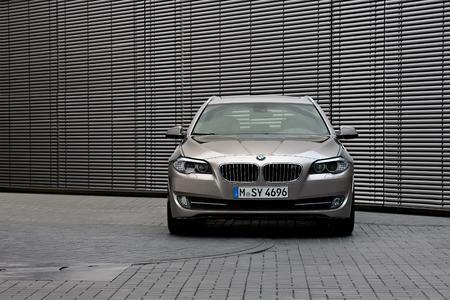 Offering best in class performance, fuel efficiency and emissions, I have high hopes for the new 5 Series Touring here." 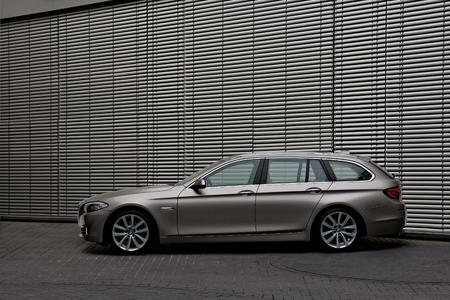 The new BMW 5 Series Touring is an uncompromising synthesis of power, handling, versatility and elegant style. 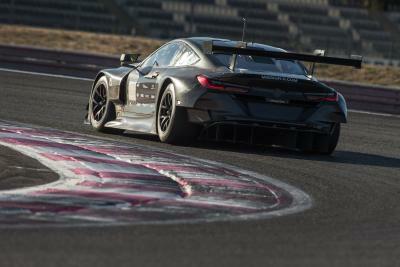 It has been designed to reflect its almost perfect 50:50 weight distribution with beautifully balanced proportions, short overhangs, a flowing roofline and a long, contoured bonnet. It is at once a sporting, dynamic and attractive car with intelligent versatility built in. For example, all models feature 40/20/40 flat-folding rear seat backrests, a luggage load cover that retracts and lowers automatically with the tailgate and a self opening rear window for ease of loading smaller items - a unique feature in the market. All models also feature self-levelling air suspension at the rear to ensure that the Touring is unaffected when carrying heavy loads. For the comfort of driver and passengers alike Dakota leather upholstery is now standard for all models as is automatic air conditioning with two-zone control. Outside, the roof rails are now finished in matt aluminium, although black high gloss or matt black can be specified at no cost and chromeline exterior window surrounds are now standard. Matt aluminium or high gloss shadowline can be specified optionally. Park Distance Control, front and rear, and Bluetooth telephone preparation are also now standard for all models while a USB audio interface and ambient lighting are standard for six-cylinder cars. The boot capacity of the new Touring is 560 litres, 60 more than the outgoing model, and a huge 1,670 litres with all rear seats folded. A further option is Extended Storage that includes "cargo" functionality for rear seats. This allows the rear seat backrests to be fixed in a more upright position thereby increasing luggage capacity by 30 litres and minimising wasted space behind rear seats. This feature increases normal load capacity to 590 litres as well as adding lashing rails, storage nets and straps. Naturally, a ski bag is available as an option. The new Touring has the longest wheelbase in its class at 2,968mm, creating a greater feeling of interior space. This translates into an extra 13mm of knee room for rear passengers, compared to the previous 5 Series. 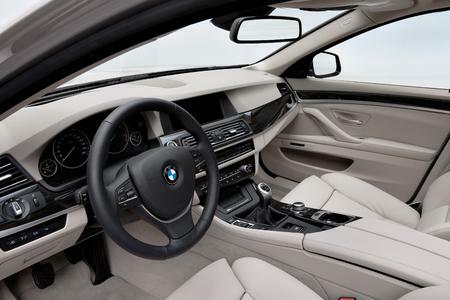 Inside, the cabin features many of the sporting but luxurious quality and comfort features found in the BMW 7 Series. Inclined seven degrees towards the driver, the asymmetrically designed centre console ensures that all controls are comfortably within the reach. The multifunctional steering wheel has been simplified, putting all of the function keys in one hand and infotainment in the other. The use of partial Black Panel technology on the instrument panel and centre console adds an extra touch of luxury to the cabin. A signature piece of BMW design, Black Panel technology integrates the centre console into the trim of the car. High-resolution electronic displays are visible when needed, but when not in use they discreetly blend in to form an elegant black band across the interior. The 520d Touring is expected to be the biggest seller in the UK. Its 1,995cc four cylinder diesel engine features the latest generation commonrail direct injection and a turbocharger with variable turbine geometry which increases power to 184hp at 4,000rpm. Combined with torque of 380 Nm from only 1,900 rpm this jewel of an engine ensures that it can provide swift and safe overtaking responses at any time. 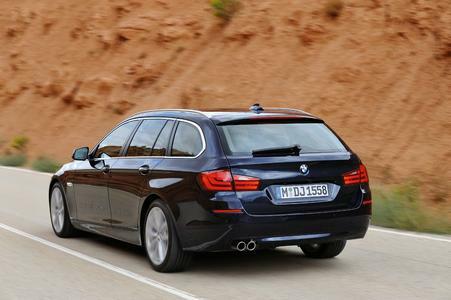 The 520d Touring accelerates from zero to 62mph in 8.3 seconds and onto a top speed of 138mph. Sipping fuel at a combined fuel consumption of 54.3mpg and offering a CO2 rating of 137g/km, the BMW 520d Touring is the most efficient car in the executive estate car segment. 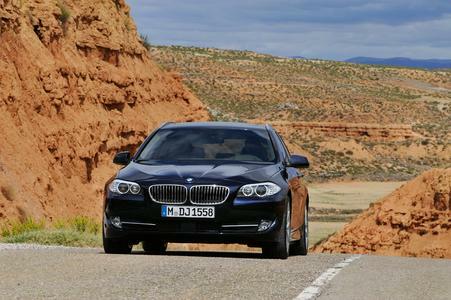 The silky smooth straight-six turbocharged engine of the 530d Touring ups the diesel ante. Now equipped with increased power of 245hp at 4,000rpm and with a peak torque of 540Nm from as low as 1,750rpm, the 530d Touring provides more of what enthusiastic customers love. With the introduction of upgraded piezo-injectors, the BMW 530d emits just 165g/km (with automatic transmission), while averaging a combined consumption figure of 44.8mpg. The BMW 530d is capable of accelerating from zero to 62mph in just 6.4 seconds and attaining an electronically-limited top speed of 155mph. 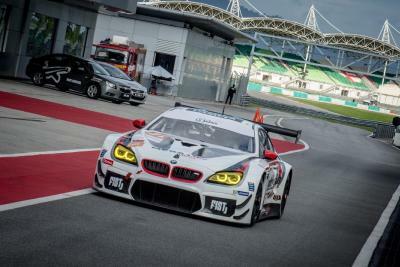 Joining the diesel-powered cars from launch are two straight-six petrol engines - the 523i and the 535i. The 535i is the first engine to combine a single turbocharged engine with High Precision Direct Injection and VALVETRONIC - BMW's own system that controls how much the engine's valves open for optimum efficiency. These measures allow the engine to meet strict emissions regulations whilst delivering optimum performance with a zero to 62mph time of 6.0 seconds and an electronically-limited top speed of 155mph. Consumption and emissions figures reflect its technological prowess with 33.2mpg on the combined cycle and CO2 emissions of 197g/km, both values using the more popular automatic transmission. The naturally-aspirated 523i Touring has also utilises High Precision Direct Injection resulting in high-revving, responsive driving characteristics, combined with low fuel consumption and emissions. The 523i unit delivers maximum output of 204hp at 6,100 rpm and a peak torque of 270Nm from 1,500 all the way through to 4,250 rpm to ensure smooth progression at any speed. 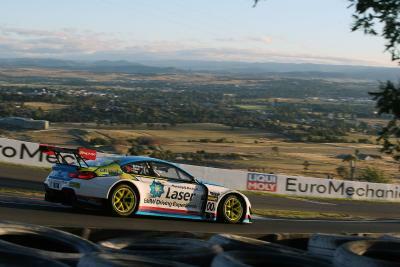 Its responsiveness translates into a zero to 62mph speed of 8.2 seconds with a top speed of 155mph*. Its economical nature delivers CO2 emissions of 183g/km and a combined consumption of 36.2mpg. The new BMW 5 Series Touring comes with a dazzling array of EfficientDynamics technologies. The BMW 520d Touring is the first 5 Series to come with Auto Start-Stop, reducing the engine idle period when coming to a short stop. All manual gearbox models come with an Optimum gearshift indicator to help drivers decide when to change gear to optimise the car's efficiency. Completing the panoply of BMW's pioneering EfficientDynamics package are Brake Energy Regeneration, Active Aerodynamics, Low rolling resistance tyres, Electric Power Steering and lightweight engineering throughout the vehicle. High-precision direct fuel injection is also fitted on both petrol models. All BMW 5 Series Touring models come as standard with a six-speed manual gearbox which has been optimised compared to previous transmissions for greater efficiency. A redesigned gearshift lever and enhanced internal packaging have resulted in a smoother, sportier gearshift. The option of BMW's new eight-speed automatic transmission brings the luxury and refinement of the 7 Series to the new Touring range. While being six per cent more fuel efficient, the weight and size of the gearbox remain unchanged. Buyers of all variants can specify the eight-speed automatic gearbox or an eight-speed Sport automatic transmission with steering wheel mounted paddles for those that prefer more enthusiastic style of driving. For those BMW 5 Series Touring models specified with Variable Damper Control or Adaptive Drive packages, the Drive Dynamic Control (DDC) chassis configurator is fitted to enhance ride and handling still further. DDC allows for fine tuning of the chassis with the choice of Normal, Comfort, Sport and Sport+. Each mode changes the levels of steering assistance, throttle response, gear change characteristics, degree of Dynamic Stability Control interaction and, courtesy of adjustable dampers, the ride and handling characteristics. 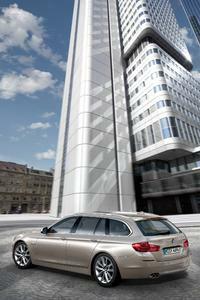 The BMW 5 Series Touring can be specified with Park Assist to enhance driver convenience. Once a button on the centre console is pressed ultrasound sensors located in the side indicator surrounds scan the road either side of the vehicle for an appropriate parking space. On location of a suitable free bay the driver then only need operate the accelerator and brake pedals while the Park Assist system swiftly slots the car into the space with ease. Four-wheel Integral Active Steering can also be specified for the first time on a 5 Series Touring and a car equipped with it benefits from a turning circle reduced by half a metre. Meanwhile, the Surround View system uses cameras in the side mirrors and the front wheel arches in conjunction with Park Distance Control and the optional Reversing Assist camera to provide a 360 degree view on the iDrive display for perfect parking. The BMW 5 Series Touring is offered with a wealth of optional equipment to enhance driver safety, comfort and enjoyment. Head-up Display, Night Vision with pedestrian recognition, Lane Departure Warning, Lane Change Warning, Speed Limit Info and two rear entertainment packages are all available. In the UK the BMW 5 Series Touring will be offered with four optional equipment packages. BMW Business Advanced Media and BMW Professional Multimedia packages include BMW Navigation, BMW ConnectedDrive - Assist and Online and Voice control. The Dynamic package includes 19inch alloy wheels, Sport seats, Anthracite headlining, Sport leather steering wheel and High-gloss exterior trim. The Visibility package includes Adaptive headlights, Xenon headlights, High-beam Assist and headlight wash. The new 5 Series Touring goes on sale on 18 September, 2010.